The first political book I read was Barry Goldwater’s “Conscience of a Conservative.” It was my Mother’s copy that she received while she was active in the Young Republicans and the Goldwater for President movement in the early 1960s and I still have it. You can read Goldwater’s Conscience of a Conservative free through this link and I highly recommend it. This slim paperback, ghostwritten by L. Brent Bozell, Jr., was a defining work for the modern conservative movement and along with the Sharron Statement stands as one of the best statements of the foundational principles of the conservative movement. To understand how importance Goldwater’s book was it is important to understand the milieu in which it was written. The year was 1960 and in contrast to Nixon’s “me-too-ism” during the 1960 presidential campaign, Goldwater was traveling around the country as chairman of the Republican Senatorial Campaign Committee, selling his new brand of conservatism. The book was intended, Senator Goldwater said, “to awaken the American people to a realization of how far we had moved from the old constitutional concepts toward the new welfare state.” The book quickly went through twenty printings and sold 3.5 million copies, and it is still in print. The book’s strong statement of the dangers of, and opposition to, world Communism helped define the conservative movement as the natural political home of first- and second-generation Eastern Europeans, Cubans, and Asians who had fled Communist revolutions in their homelands, and solidified Barry Goldwater as the premier spokesman for rolling back the Communist tide. During the 1960 campaign, Goldwater visited almost every state and appeared at dozens of party conventions and smaller gatherings. That experience put him in contact with grassroots Republicans all over the country. After Nixon’s defeat, and more than two years before the 1964 election, “Draft Goldwater for President committees” were formed in large measure as a response to L. Brent Bozell’s eloquent framing of Goldwater’s beliefs and principles. Which leads us to Senator Jeff Flake’s new book, whose title is also “The Conscience of a Conservative” and while the Flake book is a publicity-seeking rip-off of Goldwater’s title it has neither the intellectual weight, nor the principles, nor the eloquence of Goldwater’s original. Far from being a cogent statement of conservative principles it is more a hypocritical book-length screed against President Trump and, more tellingly, against the millions of Americans who voted for Trump and his agenda. Since entering the Senate in 2013, Jeff Flake has, time and again, proven he is part of the indulgent hypocrisy in Washington. While he waxes poetically about conservative principles, his Conservative Review Liberty score is an abysmal 53%, also known as: 'F.' In 2013, I watched first-hand as Flake refused to sign a letter pledging to defund ObamaCare, among his many betrayals to conservatism. 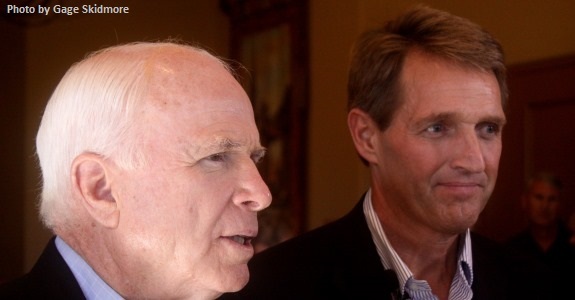 Jeff Flake is neither a conservative nor does he have a conscience. Mr. Bozell is right, but he is, in our view, too kind to Senator Flake. …I believe Flake loses his way by failing to distinguish between conservatism and the Republican Party. While conservatives have sought to advance political aims through the Republican Party, the Republican Party has never been a truly conservative party. The Republican Party has only nominated two true conservatives for president: Barry Goldwater and Ronald Reagan. A truly conservative party would have no trouble replacing the Obamacare mandates with individual choice in health insurance and reining in Medicaid costs to taxpayers. Yet Republicans can’t muster a simple majority in the U.S. Senate to do that. Trump’s populist nationalism was always a part of the Republican coalition. Flake has been in Congress, first in the House and now in the Senate, since 2001. He has been part and parcel to everything that is wrong with the Republican Party and why it “has never been a truly conservative party” – the Bush bailouts, the failure to stop Obama’s illegal executive acts, and the failure to use the constitutional powers of Congress to rein-in spending and the growth of government during the Bush and Obama years. In short Jeff Flake is not and never has stood for the conservative principles he now claims to rally Americans to embrace. Flake is lonely because that’s hardly the definition of a conservative or a man of conscience. We urge CHQ readers to skip Flake’s screed against the voters he has failed as a member of Congress and read the original Goldwater – Bozell version of Conscience of a Conservative instead. Submitted by Ckm4cuqB2q on Thu, 08/03/2017 - 13:03. Another politician to ignore. This guy has no shame. He is a complete Smiling Jack phony. Submitted by Shandor on Wed, 08/02/2017 - 22:56. Flake has always been a Globasocialist along with the Bushes, Clintons, Cuomos, Kennedys, and of course the cadre of RINOs. Unfortunately our intellectually lazy populace keeps fools like this in power. On a lighter note, it's great that Bozell references Eisenhower Republicanism's unmoored beliefs, because as we speak, socialist websites like OpEdNews are longing for Eisenhower's brand of policy! We're still in the era of "If the Democrats proposed to burn down the Capitol, Republicans would phase it in over five years!" Submitted by email_registrat... on Wed, 08/02/2017 - 14:52. Flake is the Best Description of Flake! Submitted by email_registrat... on Wed, 08/02/2017 - 14:02. I have the original book and it is as true today as it was back in the early 60's! And I have re-read it several times. As for Mr. Flake, his name is the best description of him. He has no Principles, no Honor and is a stain on the state of Arizona. He, and his "Daddy" McCain are the models of the need for Term Limits. Submitted by b8RYyjCffa on Wed, 08/02/2017 - 12:09. Here we have another one that we have to get rid of. He has learned the art of hiding behind his true ambitions. To everyone once you learn about these people we must inform the rest of the community about them. We have to stop making the same old mistakes. He was being interviewed the other day on TV. and I heard what he said. All I know this guy has to go. And he is from Calif. if I'm not mistaken. They are all coming out of the wood works. NO HE HAS TO GO.